WAKE-UP to WILDLIFE in your own WILDERNESS PARADISE acreage property, of 10.6 Acres of land with Bear, Moose, Lynx, Wolf, Fox etc., and the SATISFACTION of building on your own acreage land an SELF-SUFFICIENT Hunting CABIN, ECO Retreat, small farm or House... in Timmins, Northern Ontario, Canada-home of Shania Twain and the centre of First Nations Canadians the CREE and OJIBWAY first nations people, N.Ontario AND NO FLUORIDE in the city water ..Build your own CABIN or House with plenty of room for expansion-Zoned RESIDENTIAL by MPAC and A Great TRAVEL Destination...NO SARS, NO West Nile, NO MAD COW, and NO Pollution.We can even drink from the lakes and rivers in this area. or you may Inquire by email or phone about our land in Uganda or Paraguay. ***10.6 Beautifully FORESTED Acres mainly on a High ( 800 ft. above sea level) and mainly Dry Landscape with plenty of both HIGHWAY and RIVER Frontage.Several good spots to build on. 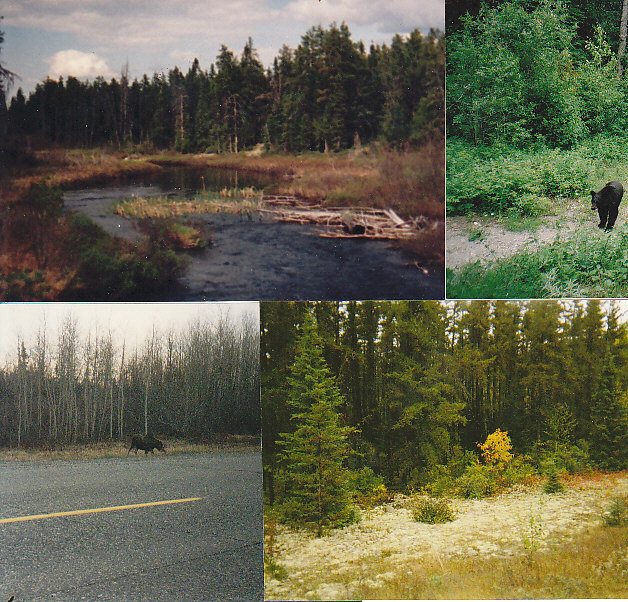 ***Property is surrounded by Forested CROWN land and LAKES,and vibrating with WILDLIFE,such as Bear, Moose,Wolf,Lynx. ***This 10.6 acre lot is a Very PRIVATE & SECLUDED property,yet ONLY 15 MINUTES to CITY Life,in Timmins, Ontario's Gold-Mining capital,and HOME to country singer, Shania Twain with all the amenities of any small city, such as Shopping MALLS and a modern HOSPITAL. **Just "around the corner" from a planned Provincial PARK land giving this property (acreage) future COMMERCIAL value. ** 10 YEAR TAX HOLIDAY for ANY New businesses starting in Timmins (including foreign nationals). **NON-CANADIANS are MORE than WELCOME to BUY these properties. For ECO-TOURISM,HUNTING,fishing,CAMPING,your own PRIVATE TRAVEL destination or a Retreat,at its BEST.. come to Northern Ontario,Canada......A SMALL PRICE to pay for a LIFETIME of ADVENTURE, RECREATION, BACK-TO-NATURE land and even PROFIT!Come and see it for yourself,first. We am so confident you will LOVE this property,after seeing it,that,if you send a DEPOSIT of 10% of your OFFER,We WILL RETURN YOUR DEPOSIT,IN FULL,if within 1 MONTH you decide not to buy..NO QUESTIONS ASKED! Think of this:"PROPERTY is the ONLY Investment which doesn't require work to INCREASE in VALUE,because the availability of PRIVATE LAND is Decreasing while the POPULATION of this planet is INCREASING"